We’ve seen plenty of beauty makeovers go viral, but this before/after story might just be the cutest yet. When Redditor @Katingvideos, a 15-year-old budding makeup maven based in the U.K., shared her most recent makeup experiment, she wasn’t prepared for the overwhelming support that would follow. The teen, who goes by Kate and prefers not to share her last name, has been honing her own makeup skills over the last two years, but enlisted her beautiful grandmother as a model this time. Reddit users simply couldn't contain their excitement, and were quick to gush over the glam new look. 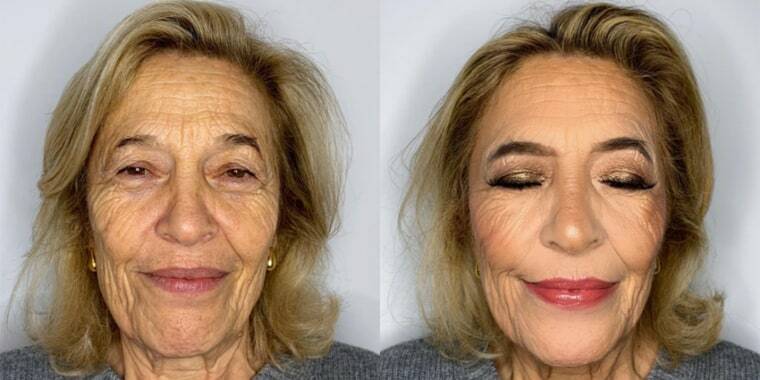 "This is amazing, I see so many people getting makeup wrong on older women, but you really nailed it!!! She looks lovely (before and after)," wrote one user. Another Redditor wrote: "You really transformed her skin! That’s what really stands out to me. And you did it without making it look dry or creased. Bravo!" The multigenerational duo often chat about makeup, and Kate says her grandmother helped fuel her passion for makeup from the get-go. "I remember when I was starting to get into makeup, my grandmother was always the one going makeup shopping with me and buying me the products that I had been wanting for ages. This has not changed!" she told TODAY Style over email. "It’s funny because most people would go do that with their mother but my mother works in the industry already so she does not like shopping for makeup with me; therefore, my grandmother is the one I go to when I want to send a makeup look or talk about a cool product." Considering their mutual love for all things beauty, it was only a matter of time before Kate sought out her grandmother’s help to polish up her makeup skills. “Makeup is my passion and it pretty much takes over my life at the moment, so when my grandmother and I were talking one day, I had the idea of doing this little makeover. I wanted to try doing makeup on someone older as I had never done it before and apparently it’s very hard, so I wanted to see how I would do,” Kate said. And her grandmother was definitely up for the experience! “She was fine with it, but didn't really know what to expect,” Kate said. On a normal day, Kate's grandmother typically opts for a more toned-down makeup look — a little mascara, her signature Dior red lip and occasionally blush — so the glam look the teen created was definitely a bit outside of her comfort zone. Kate added some definition to her grandmother's brows, gave her a va-va-voom smokey eye, contoured her face and topped it off with her signature red lip. The final look was simply stunning and Kate's grandmother could hardly believe her eyes. "When I was done, she laughed! She was a bit shocked because she isn't used to this heavy kind of makeup, but we both laughed together after that, so it was fun," Kate said. Although Kate enjoyed giving her grandmother a fun new look, the 15-year-old said she also loves her grandmother's dedication to her signature look. "I admire how she always wears red lipstick out even if she is older," she said. Aside from serving as a sweet bonding moment, the impromptu makeover also taught Kate a few valuable makeup tricks. "I know for sure that I would maybe do things slightly differently next time. We can only improve, and I think it’s important to acknowledge that. I’m sure in a few years I’ll look back on this and find something I don’t like and could've done differently, but we learn every time we practice," she said. As for Kate's grandmother? Well, she's pretty grateful for the experience, too, and told TODAY Style she'd definitely do it again. "It was a pleasant moment with my granddaughter. I was surprised to see how much you can change one’s facial structure/looks with makeup," she said. After receiving an outpouring of support, Kate and her grandmother are now thinking ahead to their next makeover. "It has served as a wonderful experience and we want to do it again! I’m thinking I can use colorful makeup next time," Kate said.